On December 7, 1985, our Most Worshipful Grand Master Perry M. Parker was installed as Grand Master of The Grand Lodge of Texas in a very unique ceremony. In 1968, M:W: Parker served as District Deputy Grand Master_ under the Installing Officer, Past Grand Master J. W. Chandler; and, the Installing Marshal and the Installing Chaplain, Past Grand Masters Herman Vinyard and Dan B. Jordan also served as District Deputy Grand Masters under R:W: J. W. Chandler in 1968. As far as it is known this is the first time that a Grand Master has been installed by the Past Grand Master he served as District Deputy Grand Master and two fellow District Deputy Grand Masters, now Past Grand Masters. Certainly, it seems that 1968 was a good year for District Deputy Grand Masters to become Grand Masters and the Masons in Texas look forward to another great year of Masonry from this heritage. MW: Perry Parker was born in Kosse, Texas on March 27, 1916; and was one of ten children: seven girls and three boys, born to W. P. and A’Della Parker. After completing his education, M:W: Parker entered the construction business in Elizabeth, New Jersey. In 1950, he returned to Texas and resided in Waco until 1955, when he moved to Port Arthur, Texas, to establish his permanent home. M:W: Parker attends the Trinity Baptist Church and retired as a construction supervisor in the heavy steel industry on February 1, 1978. In Port Arthur, M:W: Parker met and married Ada Venable and between them they have one son, Brady L. Parker of Hewitt, Texas, and three daughters, Mrs. Bill (Dorothy) Worl of Bartlesville, Oklahoma; Linda Nell Parker of Lorena, Texas; and Mrs. Robert (Gay) McCauley of Port Arthur, Texas. The Parkers have a close and devoted marriage and share the love of six grandchildren. While living in Waco, M:W: Parker was raised a Master Mason in Herring Lodge No. 1224 on January 2, 1952. Upon moving to Port Arthur, he continued his Masonic career by affiliating with Cosmopolitan Lodge No. 872 on November 15, 1956. He served Cosmopolitan Lodge as Senior Steward, held other offices and became Worshipful Master for the term 1964-1965. 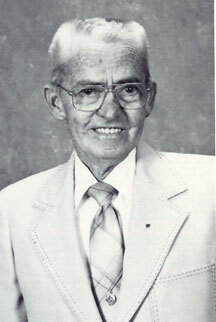 He was elected secretary of the Lodge in 1975 and continues to serve in that office. M:W: Parker has served Grand Lodge as District Deputy Grand Master of Masonic District 26-A in 1968; he was elected to the Committee on Work in 1969 and continued to serve on this committee until his election as Grand Junior Warden in 1982; he was elected Grand Senior Warden in 1983; Deputy Grand Master in 1984; and Grand Master in 1985. Active in the appendant orders of Freemasonry, our Grand Master is a member of Port Arthur Chapter No. 250, RAM; Port Arthur Council No. 185, R&SM; Port Arthur Commandery No. 73, K.T. ; and a charter member of York Rite College No. 90 of Port Arthur. He is a member of the Galveston Scottish Rite Bodies and was coroneted a 33rd Degree, Inspector General Honorary on November 22, 1983. In addition, he is a member of El Mina Shrine in Galveston; Casbin Grotto of Port Arthur; Waco Chapter No. 7 of the Order of the Eastern Star; and the Royal Order of Scotland. M:W: Parker has been awarded the Legion of Honour (Honorary) of the DeMolay; and currently serves as Eminent Viceroy of San Felipe Conclave of the Red Cross of Constantine at Galveston. Certainly, the long hours of dedicated Masonic labors have granted our Grand Master with the wisdom of Masonic law, custom and tradition which is essential to the government of our Fraternity. But more than this, his kindness and thoughtfulness for his fellow man will leave an impact upon Masonry in Texas through the years ahead.